Don Tate is the author and illustrator of Poet: The Remarkable Story of George Moses Horton (Peachtree), for which he received the Ezra Jack Keats New Writer Award. He received the Ezra Jack Keats New Writer Honor for It Jes’ Happened: When Bill Traylor Started to Draw (Lee & Low), illustrated by R. Gregory Christie. Tate is also the illustrator of several picture books, including Whoosh! Lonnie Johnson’s Super-Soaking Stream of Inventions, The Amazing Age of John Roy Lynch (Eerdmans), and The Cart That Carried Martin. Don lives in Austin, Texas. 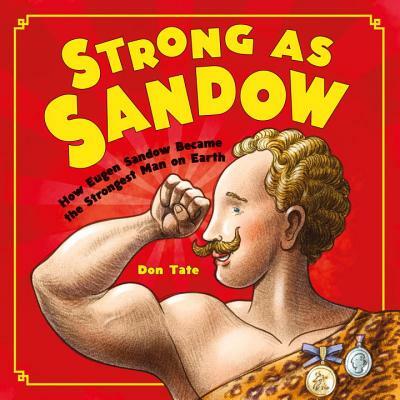 Sparked by his own passion for bodybuilding and physical fitness, Tate recounts the story of Eugen Sandow (1867–1925) in this inspirational picture book. The biography begins during Sandow’s childhood in Prussia, where he used sports and exercise to develop from a frail, skinny child into a robust, physically active young man and later into a world-famous strongman in the United States, with his own successful business enterprise. The text progresses chronologically, with references to various geographic settings and specific historical events. Tate’s mixed-media illustrations feature characters, especially Sandow, with oversize, highly expressive faces. The muted colors are appropriate to the historical setting. The artwork is chock-full of humorous, cartoonish details that greatly enhance the story. In the afterword, Tate provides additional biographical information on both Sandow and himself. He includes a few simple exercises for kids and a well-developed bibliography. This title would be a good companion to Meghan McCarthy’s Strong Man: The Story of Charles Atlas, reinforcing the themes of physical fitness and the importance of healthy choices. VERDICT An excellent introduction to a historical figure that will appeal not only to children already interested in sports and fitness but also to those in need of encouragement. Tate introduces his readers to one of the first international sports stars in a well-researched biography of bodybuilding strongman Eugen Sandow. Friedrich Wilhelm Müller began life in Prussia as a weak and sickly child who longed for activity. A boyhood trip to Italy changed Friedrich's life, when he learned about the gladiators of Rome and their belief in daily strenuous exercise. Tate explores Müller's life as a student, circus performer, and model as he grows (pun absolutely intended) into the professional strongman Eugen Sandow. Digitally created illustrations use dramatic grainy shadows that suggest the inky carbon smudges of old newspaper photos. As in many old newspapers, all the characters depicted in the story are white. Tate wisely introduces some diversity in the backmatter by showing a multiracial group of boys and girls as models for four simple exercises. The other strongmen that appear in the book present a range of physiques, a nicely designed if subtle hat tip to the idea that fitness can be reflected in different weights and sizes. Additional backmatter includes an afterword on Sandow's life, Tate's relationship with the sport of bodybuilding, and a bibliography that includes Web links when possible. The only thing that's missing is a timeline, a feature that is always appreciated. Readers will find parallels with Meghan McCarthy's picture-book biography of Charles Atlas, Strong Man (2007), but Tate's celebration of Eugen Sandow makes a solid addition to any biography section. "Strongest Man on Earth"? With competing reports, self-promoting hype, and Louis Cyr (of Debon's The Strongest Man in the World, BCCB 5/07) on the strongman show circuit, it's hard to award that title to Eugen Sandow with certainty. He is, however, considered the father of body-building, and he turned himself from a scrawny kid into a bundle of muscle. After an exhausting career as strongman, Sandow, no longer as bulky and buff as he was in his heyday, "launched the Great Competition," a men's body-building contest that assessed not only an impressive physique but also overall health and athleticism. While Louis Cyr and other muscle-flexing contemporaries have passed into the history and record books, Sandow lives on as the gold-plated statuette awarded annually to Mr. Olympia. The grunting, hefting, and posing are presented here with a liberal helping of humor, and if viewers aren't rolling on the floor over the early twentieth century body-builder's costumes, they will be over Sandow's own stint as a life model in an art studio. As engaging as Sandow's story is, endnotes command equal attention, particularly the historical follow-up in the afterword and tate's own body-building interests and experience (complete with photograph) in the author's note. Source notes, a bibliography, and suggestions for some simple strengthening exercises are also included. At the turn of the twentieth century, Englishman Eugen Sandow was known as the strongest man alive, a trailblazer in bodybuilding and fitness, and a personal trainer to King George V. Though his life story may not be the stuff of history textbooks, his experiences are a window to popular culture in the Victorian era and the emerging idea of celebrity. He was one of the first to inspire people to pay attention to their health and to be physically active long before it became a mainstream practice. He became a world-wide phenomenon by performing feats of strength in circuslike shows and hosting bodybuilding competitions for spectators. Both Tate's narrative and colorful illustrations reveal his own personal experience in the bodybuilding arena and his respect for Sandow's lifelong goal. Throughout his life, he perfected his physique and the larger-than-life persona that accompanied it, but Tate's measured biography doesn't shy away from the imperfect aspects of Sandow's personality. Friedrich Wilhelm Müller loved athletics as a boy but "playing sports required a strong, healthy body" and Friedrich was skinny and frail. Though he was often "too sick to play," he remained undaunted by his physical restrictions and played sports, determined to be a healthy and strong person. As Friedrich grew older, his love of athletics never dimmed. Though his father wanted him to attend university and focus on a career, Friedrich could not ignore his drive to be active--he decided to join the circus. When circus life didn't work out for Friedrich, his journey toward being "the strongest man in the world" began in earnest. He trained as a bodybuilder, changed his name to Eugen Sandow and soon became a professional strongman. With time, work and some (possibly slippery) performance tricks, Eugen gained world fame and launched the first organized bodybuilding contest, ever-so-humbly awarding the winner a statue of himself. Eugen Sandow's exercise and diet regimens are used to this day and the prize for the Mr. Olympia bodybuilding competition is still the (slightly updated) Sandow.